Syria's growing refugee crisis Jump to media player With no end in sight to the crisis in Syria, refugees are crossing the border into neighbouring countries, such as Turkey, in increasing numbers. Syria's refugee child workers Jump to media player The war in Syria has forced thousands to flee and disrupted the education of children who could be the key to rebuilding the country in the future. The horror of Syria's four-year conflict has created the worst refugee crisis in two decades, with more than one million Syrians fleeing to Lebanon. One third of them are children, almost all of whom are unable to attend school, making them vulnerable to child labour or radicalisation. A campaign that urges world leaders to back a fund ensuring refugee children have access to education is being backed by Downton Abbey actress Laura Carmichael, who is a World at School Ambassador. 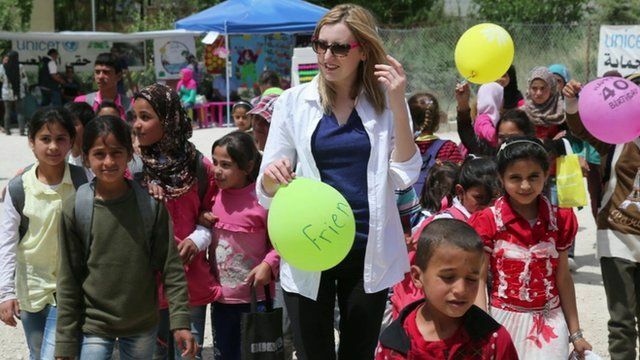 She told the BBC how she got involved in the campaign after meeting World at School co-founder Sarah Brown, and her experiences of visiting those who were living in terrible conditions in the Bekaa Valley.